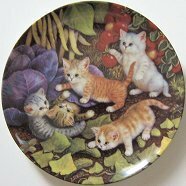 This collectible cat plate features five kittens playing among the vegetables in a garden. Produced by Kahla in Germany and distributed by the Bradford exchange. Copyright 1996, this plate is 7 3/4" in diameter. Previously owned but no visible defects. For decorative use only.